Between school, sports, dance, scouts, and numerous other extracurricular opportunities, many young children have daily schedules that are packed. In a rush to introduce their children to a variety of opportunities, some parents may inadvertently overlook the arts – and in particular, the opportunity for music to benefit their children in a variety of ways. Did you know, for instance, that music and math are highly intertwined? It is also proven that, over time, learning music helps improve both short and long-term memory. At Moravian Academy, 106 Lower School students are currently enrolled in the Suzuki String program, which begins in pre-kindergarten. 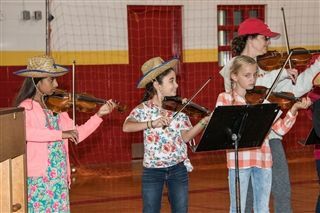 Like the long line of students who have come before them, they will play through Grade 5 and many will continue with the Middle and Upper School orchestras. Perhaps the most interesting part of the program? That their parents learn alongside them. Pre-kindergarten students at Moravian Academy are introduced to the violin and cello through demonstration and hands-on experience, including how to hold each instrument, clapping simple rhythms, singing Suzuki songs, and asking questions. This helps them develop a preference for which instrument they might want to play the following year. When that time comes and parent and child are learning together, parents are encouraged to play recordings of the music that their children will learn to play during normal activities like driving to school or making dinner. The home practices are short at first and grow longer as the child's ability to concentrate grows. Time magazine notes that when children learn to play music, their brains begin to hear and process sounds that they couldn’t otherwise hear. This helps them develop “neurophysiological distinction” between certain sounds that can aid in literacy, which can translate into improved academic results for kids. In addition to weekly lessons, Moravian Academy’s Suzuki students also attend a large weekly group ensemble that provides time for socialization and opportunities to show each other the newest songs they have learned to play. In their second year and beyond, they use the software program SmartMusic to help prepare them for performances, which become more frequent throughout the academic year. By fourth and fifth grades, they attend orchestral rehearsals in place of the ensemble. And every five years, the Moravian Academy Lower School strings are invited to perform on the biggest stage of all – at New York’s famed Carnegie Hall, in the School for Strings celebration concert. “There are numerous benefits to playing a musical instrument. As an educator, I’m most inspired by the current research regarding musical training and brain development,” says Wetzel. “It improves language skills and executive skills that are fundamental to early childhood education, more than any other activity. It’s exciting to see students working and concentrating in order to play a musical passage correctly because, in the process, I’m confident that activity is improving their ability to learn.